Extended editions of films normally are seen in the DVD and Blu-ray release, and very rarely get a theatrical release. But fans of Peter Jackson‘s The Hobbit trilogy should be excited to know that the longer cut of all three films will be hitting the big screen this fall. More on this story after the jump. It isn’t entirely unusual to see a the price tag for a blockbuster tentpole films to have an eight or even nine-figure budget. But when the franchise is as large as The Hobbit trilogy, you’ll probably be doing more than just burning a hole in your wallet. Trying to figure out the cost of said films wouldn’t be easy, considering you have to pay the talent, the production crew, the cameramen, the visual effects artists, the writers, the director, cinematographers, and then there is hauling the equipment, traveling, reshoots, and much more. But when you have a successful franchise like The Hobbit, you generally would have even more money to work with to make a sequel more exciting. We are now learning how much you would need to produce a film of that magnitude, and it is a pretty big number. 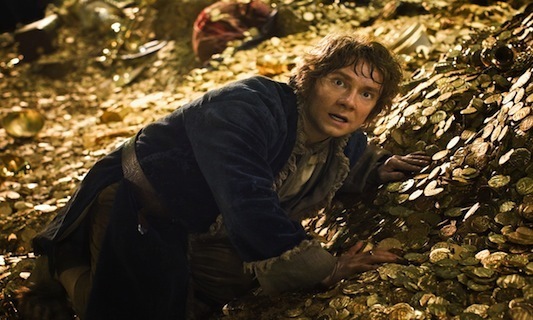 It has cost WB approximately $745 million to make The Hobbit: An Unexpected Journey and The Hobbit: The Desolation of Smaug. And since the film is a trilogy we can expect that number to only skyrocket. But it is okay considering that the two Hobbit films combined grossed nearly $2 billion worldwide. Hit the jump for more info. There’s a wealth of memorable moments to be found within Peter Jackson’s massive Lord of the Rings trilogy. One of these moments comes in the third and final movie, The Lord of the Rings: Return of the King, when hobbit Pippin (Billy Boyd) is ordered to sing a song for the Steward of Gondor, Denethor (John Noble), to whom he volunteered his service. 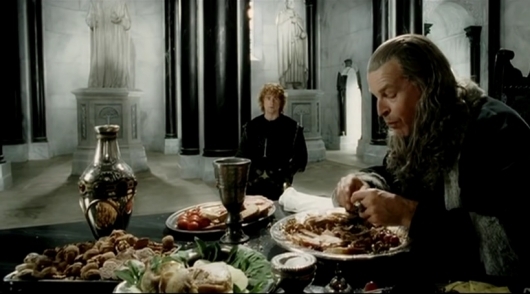 As Pippin sings his sad song, titled “The Edge of Night,” Denethor feasts away carelessly while his son Faramir (David Wenham) and his soldiers, who were sent into an impossible battle by the Steward, are met with waves of orcish arrows. If you too are fond of this scene and Pippin’s song, depressing as it is, there’s some good news to be had today. It’s been announced that Billy Boyd will be semi-returning to Middle-earth by recording the end credits song for the third and final movie in The Hobbit trilogy, titled The Hobbit: The Battle of the Five Armies. You can read more and check out Boyd singing “Edge of Night” in Return of the King below if you don’t remember it or just want to see it again. For as long as we’ve known that The Hobbit would be adapted into a new trilogy of movies it feels like we’ve known that one of the movies was going to be titled The Hobbit: There and Back Again. As it turns out, this is not the case and another title has been chosen for the third and final movie. As time has moved forward and the trilogy has come together, director Peter Jackson and company have grown more and more aware that the title simply wouldn’t work. 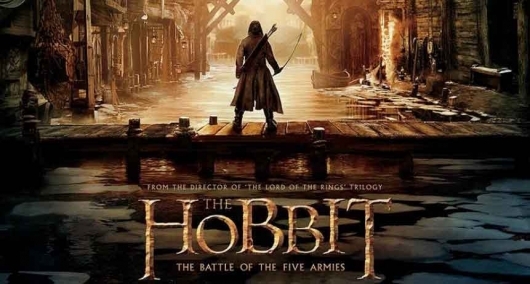 This eventually led to the choice for the official title: The Hobbit: The Battle of the Five Armies. 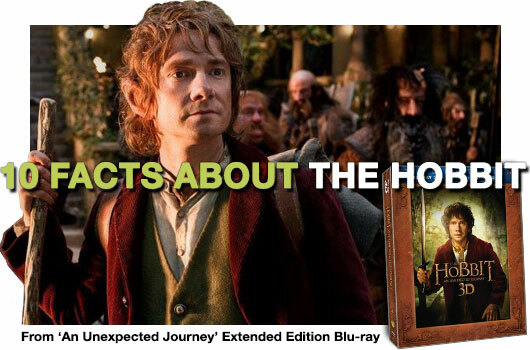 The Hobbit: An Unexpected Journey – Extended Edition, which recently came out on Blu-ray, 3D Blu-ray, and DVD, comes with about 9 hours of bonus features, including additional footage inserted into the film. This release contains more behind-the-scenes looks, interviews, and so many tidbits about the film, its predecessor – The Lord Of The Rings – and the Tolkien universe, that you won’t know what to do with all this information. It’s truly awesome and delightful to watch. 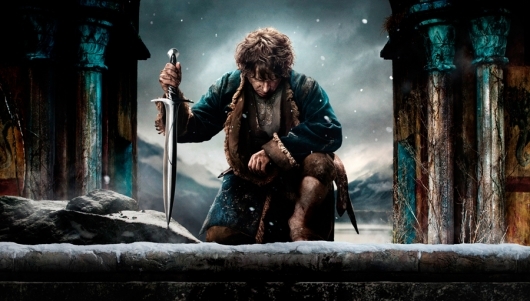 After the release of the first official look at Tauriel (Evangeline Lilly) last week, and the film’s first poster this past weekend, the first offical trailer for The Hobbit: The Desolation Of Smaug has finally debuted. Hit the jump to see the full trailer here below. 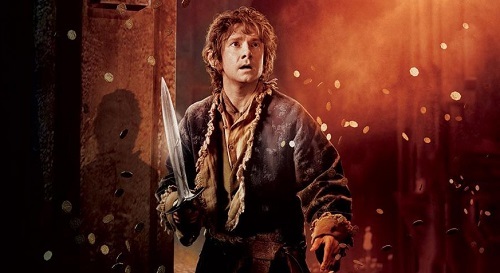 The film follows Bilbo Baggins, Thorin Oakenshield and his band of fearless dwarves, and Gandalf the Grey, who are on a quest to obtain gold that was stolen from them from a great dragon called Smaug. Not only do we get our first look at Smaug, Tauriel, Beron the Bear, and Bard, but we also get to see the return of Legolas (Orlando Bloom). 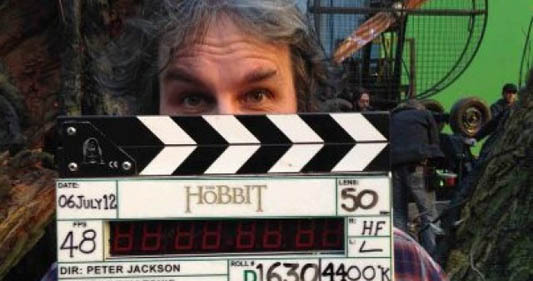 On Sunday, March 24, 2013, Peter Jackson hosted an exclusive live online event to premiere new footage from The Hobbit: The Desolation of Smaug – the second film in his trilogy inspired by the classic J.R.R. Tolkien fantasy novel – and answer questions from viewers and a selection of special surprise guests. This event was open only to those who had purchased The Hobbit: An Unexpected Journey on Blu-ray and received a unique passcode to access the live feed. Today, Jackson has released a 6-minute edited excerpt of the event on his YouTube channel. You can watch the video here below. 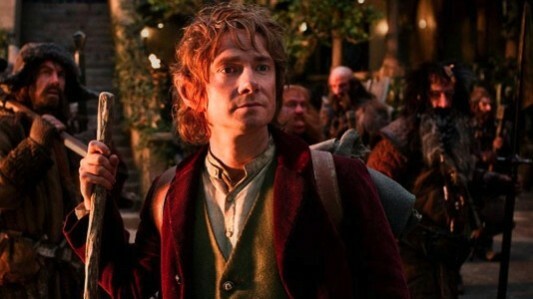 The Hobbit: There and Back Again, the final chapter in Peter Jackson‘s three-part adaptation of the classic J.R.R. 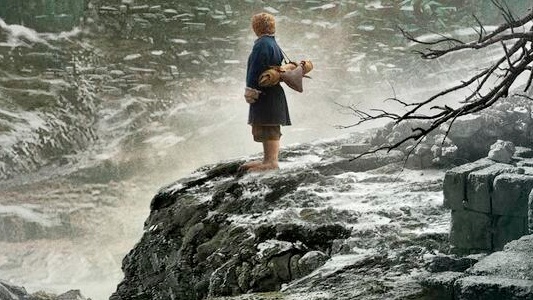 Tolkien novel that would one day lead to the creation of the Lord of the Rings trilogy, was originally supposed to open in theaters on July 18, 2014. But in a move that surprised very little, There and Back Again had its release date pushed back five months and will now open on December 17, 2014. This date shift makes a lot more sense, as each movie in Jackson’s Rings trilogy and last year’s The Hobbit: An Expected Journey all had December openings and were immense box office successes around the world. Plus it gives the director and his gifted production team some much-needed time to work on the voluminous 3D visual effects work required and fine tune the movie, and a holiday slot protects There and Back Again from contending with the blockbuster onslaught that comes with a summer release. I have seen the future, and it plays at 48 frames per second. It may not currently be without notable flaws, but technological revolutions seldom begin as such. This week I saw a Digital IMAX projection of The Hobbit: An Unexpected Journey in HFR. HFR (High Frame Rate) is a marketing term for digital video projected at 48 fps (frames per second), exactly twice the current film frame rate standard of 24 fps. As some have accurately criticized, to the unaccustomed eye this has the tendency of making the film look like a 70’s BBC TV drama or an old soap opera (that’s because rather than using film, pre-HDTV era soap operas were acquired using economically efficient video cameras which captured at a rate of 60 interlaced fields per second, or the equivalent of 30 frames per second). During scenes populated mostly by CGI characters I often felt I was watching a cutscene from a fantasy videogame. The high frame rate also appears to reveal more potential imperfections, particularly in scenes involving actors. At times Ian Holm’s (older Bilbo Baggins) face looked so waxy and dull I thought his makeup was applied by morticians. Makeup artists are going to have to be more stringent than ever in the HFR world. In fact, I’d say the majority of criticism attributed to the “eerie” look of this new process is an indication that all filmmaking disciplines will need to reinvent themselves to meet the challenge of the medium.